WASHINGTON, DC, June 28, 2010 (ENS) – Environmentalists and coal miners alike are in mourning today for the loss of Senator Robert C. Byrd, 92. The West Virginia Democrat died early this morning at Inova Fairfax Hospital in Falls Church, Virginia. 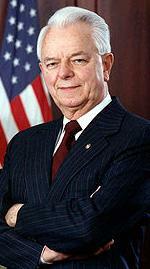 The longest-serving member of the U.S. Congress in American history, Byrd was third in the line of succession to become president in his role as the Senate’s president pro tempore. By tradition, the position is held by the most senior member of the majority party in the Senate. Senator Daniel Inouye, 85, a Hawaii Democrat, was sworn in as president pro-tempore this afternoon. Throughout his career, Senator Byrd cast 18,689 roll call votes, more votes than any other senator in American history, compiling a 97 percent attendance record in his more than five decades of service. At the time of his death, Senator Byrd was serving as the senior member of the powerful Senate Appropriations Committee, and as chairman of the Senate Appropriations Subcommittee on Homeland Security. Byrd was simultaneously serving on the Senate Budget, Armed Services, and Rules and Administration Committees. Environmental advocates and mine workers expressed their appreciation today for the work Senator Byrd did on behalf of the environment and workers’ health and safety in his more than five decades of service in the Senate. He ran for office 15 times and never lost a race. As recently as last month, Senator Byrd was demanding that the coal industry respect the miners, land, and people of West Virginia, said the Alliance for Appalachia on its website. Twenty-nine out of 31 miners at Massey Energy’s Upper Big Branch Mine at Montcoal in Raleigh County, West Virginia were killed by an explosion April 5 about 1,000 feet underground. An investigation into the incident is ongoing. He worked as a gas station attendant, a grocery store clerk, a shipyard welder during World War II, and a butcher, before he won a seat in the West Virginia House of Delegates in 1946, representing Raleigh County from 1947 to 1950. In 1950, he was elected to the West Virginia Senate, where he served from 1951 to 1952. Initially elected to the United States House of Representatives in 1952, Byrd served there for six years before being elected to the Senate in 1958. After being elected to the House of Representatives, he began night classes at American University’s Washington College of Law in 1953, but did not earn his law degree from the university until a decade later, after he was a U.S. senator. He came to the Senate before 13 current or former senators were born, including President Barack Obama, who was born August 4, 1961. “He held the deepest respect of members of both parties, and he was generous with his time and advice, something I appreciated greatly as a young senator,” Obama said. Senator Byrd was rated 68 percent by the League of Conservation Voters, indicating pro-environment votes. In 2008, he voted in opposition to offshore oil drilling and in opposition to drilling for oil in the Arctic National Wildlife Refuge. Senator Byrd co-sponsored a resolution designating June 20, 2008, as American Eagle Day and celebrating the recovery and restoration of the bald eagle, the national symbol of the United States.